The locations were lovely and our guide Akemi Nozawa was excellent. We enjoyed the company of our fellow travellers and tried lots of different food. Our guide, Akemi provided thoughtful and efficient care, all details covered to ensure the smoothest transitions and attention to the individual interests of each member of the group. The group was exceptional. All members of the group participated enthusiastically and enjoyed each others company. The variety itinerary combined the hustle and bustle of Tokyo and Osaka with tranquil stays in Koyasan and Nikko. Good number of included activities. 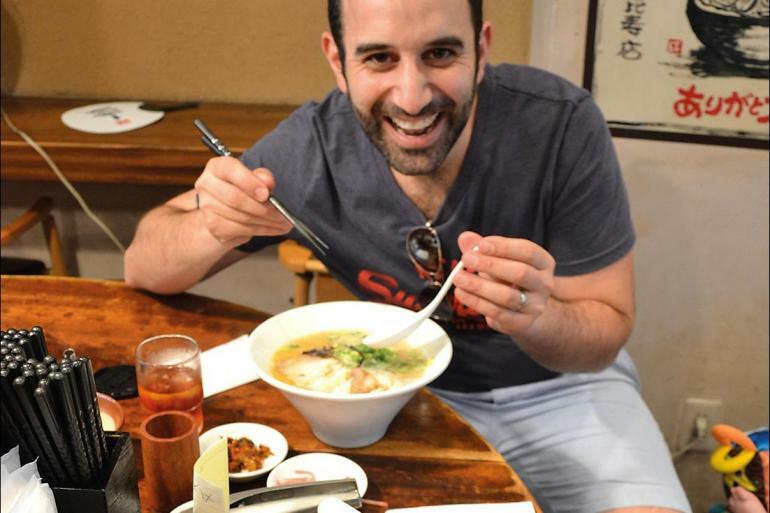 Great insight into Japanese food and culture. Excellent tour leader. Our tour guide was exceptionally good. The tour was well organised and our guide did an excellent job showing us around. Konnichiwa! Welcome to Japan. Bursting with contemporary urban culture, there are many sides of Tokyo to explore, from fascinating museums and world-class shopping, to neighbourhood backstreets lined with restaurants and karaoke bars. Before the trip starts, we recommend that you take a walk around some of Tokyo's most well-known districts, including Shibuya, Shinjuku, Harajuku and Ginza – variously known as the fashion centre, the skyscraper district, the home of quirky youth pop culture, and the upscale shopping area. Please be aware that there won't be much free time in Tokyo once the trip begins, so consider booking additional accommodation if you wish to cover anything not included in the trip itinerary. Your adventure begins with a Welcome Meeting at 6pm tonight. You can arrive at any time during the day, as there are no activities planned until this important meeting. Please check with hotel reception or look on the reception noticeboard for where and when the meeting will take place. If you're going to be late, please inform the hotel reception. Have your insurance and next of kin details on hand as we'll be collecting them at this meeting. Then join your leader for a Welcome dinner at a local Asakusa or Ueno restaurant representative of this traditional part of Tokyo - perhaps some perfectly grilled yakitori (chicken and vegetable skewers) washed down with some local beer or a drop of fine sake. For those not suffering jet-lag, consider taking a short train ride to Ginza and Yurakucho to enjoy the night-time ambiance or relax over a cocktail at one of the shiny new Marunouchi buildings near Tokyo station. Today your tour leader will take you for a morning walk around the famous Tsukiji Outer Market, where fresh seafood from Tokyo's largest wholesale fish market (recently relocated to a new site at Toyosu) is delivered daily. 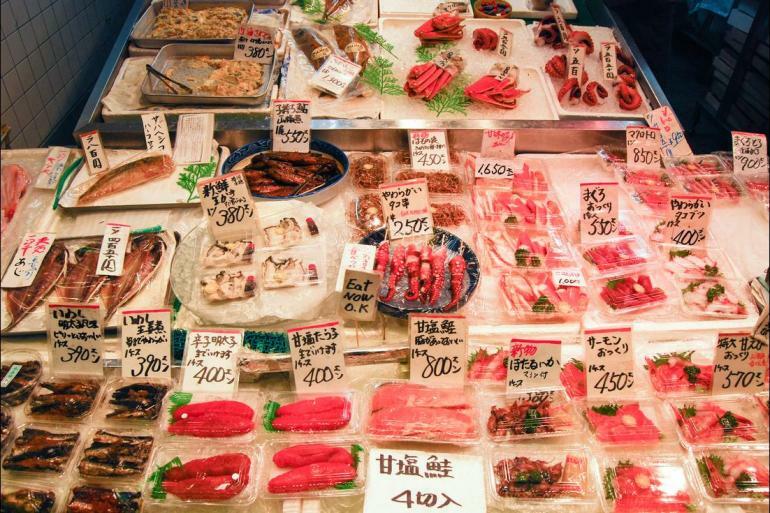 You can wander the narrow aisles of this atmospheric marketplace to find all sorts of amazing food - from fish and shellfish to barrels of green tea, dried seaweed and all manner of pickled vegetables. Sample some of the freshest fish you could hope for at the market's sushi stalls! Later, learn the art of creating soba, Japan’s famed buckwheat noodle, in a hands-on cooking class. Slurp up your creations for lunch. This afternoon you’ll take some time sightseeing in the historic Asakusa area. This is one of the older and more traditional parts of Tokyo, and is often called the temple district. Here you’ll stop by Senso-ji, the city’s oldest temple – founded almost 1,400 years ago when Tokyo was nothing more than a fishing village. If you’ve got a sweet tooth then Asakusa is also a great place to satisfy a sugar craving – try fried sweet potatoes tossed in sugar, soy sauce and mirin, or sweet red bean paste sandwiched between baked pancake batter. Afterwards, consider heading to Tsukishima to enjoy one of Tokyo's most popular dishes – monjayaki. a type of savoury pancake. Or for those who wish to explore Tokyo's urban heart, head to the mega-hub of Shinjuku and the famed Golden Gai area for its crowded alleys of izakaya, tiny bars and jazz haunts. You could also check out the observation deck of the Metropolitan Government Building for a stunning night view of the city's skyline. Wave goodbye to Tokyo at super speed as you ride the rails on a bullet train to the 17th-century Edo period town of Takayama. Travelling by Shinkansen is an absolute buzz, as you’ll reach speeds of up to 270 kmh. Arrive in Takayama within approximately 5 hours (one stop). Takayama is a charming, historic town located in the Japan alps. The region is famous for its traditional streetscapes, sake breweries and Hida-gyu (Hida beef) – the beef from a black-haired Japanese cattle breed that has been raised in Gifu Prefecture for at least 14 months. On arrival visit the nearby Hida Folk Village, an outdoor museum where the traditional thatched-roof architecture unique to the area has been recreated in a delightful mountain setting. Discover the techniques used to build farmhouses that could withstand fierce winters and long periods of isolation due to snow-closed roads. Each house is like its own self-contained museum, with displays of personal items and traditional tools. For the next two evenings you will stay in a traditional ryokan (Japanese inn). Rooms are equipped with thin futon mattresses that are spread on tatami mats for a comfortable night's sleep. Over the next two evenings you will dine on regional Takayama delicacies. Gifu Prefecture is known to produce excellent high altitude vegetables. Explore the morning markets that date back 600 years and browse the stalls of seasonal produce brought in from the surrounding countryside. Stalls are set up by local farm women from 6am every morning. Look out for the unique local style of pickles, the bags of miso wrapped in leaves, Genkotsu ame (soy bean candy), preserved fish, spices, and the delicious marshmallow treat of owara tamaten. While you're exploring Takayama, keep an eye out for some of these popular regional dishes – mitarashi dango (rice dumplings roasted in soy sauce), houba miso (miso vegetables cooked in magnolia leaf) and chuka soba (Hida's favourite noodle dish). Later, we take a short ride on a local train to the neighboring town of Hida-Furukawa, another alpine town known for its relaxed pace and picturesque tree-lined canals. Here we visit a local sake brewery to learn about the sake-making process and sample some local brews. Gifu's alpine climate and crystal clear mountain waters are perfect for creating Japan's signature drop. Back in Takayama for dinner, you'll be able to sample some more of the town's iconic dishes. Rise early and take the train (approximately 3 hours) into an important region for Shingon Buddhism. Founded in the 8th century by the Buddhist saint Kobo Daishi, Koya-san has been a centre for religious activities for over 1,200 years. You’ll visit Okuno-in, the mausoleum of Kobo Daishi, the founder of Shingon Buddhism and one of the most revered people in the religious history of Japan. Your unique accommodation tonight is in one of the many temples still operating here. You’ll live alongside Buddhist monks and follow their routine of evening meditation and morning prayers. Temple lodgings, known as shukubo, have facilities similar to Japanese ryokans. Rooms are equipped with thin futon mattresses that are spread on tatami mats for a comfortable night's sleep. Tonight you’ll enjoy an introduction to shojin ryori, or monastic cuisine, prepared by novice monks. Shojin ryori was popularised in Japan in the 13th century by Zen monks from China. Shojin ryori is vegetarian, and prohibits inclusion of meat and fish, following the teaching that it is wrong to kill living animals. Instead meals are prepared with seasonable vegetables and wild plants from the mountains. Notes: There are no western bathing facilities at the monastery. Instead, bathing is done in a traditional public bath. This is a two-step process. The first step is to thoroughly clean yourself, followed by a cleansing soak in a hot bath. Onsen are communal bathing areas and it is not permitted to wear bathing suits. While this can seem intimidating at first, it is a quintessential Japanese experience and often a highlight for travellers in Japan. For those who are more sensitive about public bathing, your leader can suggest times of day when you are likely to have more privacy. As the millennium-long home of the imperial kitchen, Kyoto is known as the centre of Japanese culinary tradition. From the aristocratic kaiseki ryori (Japan's haute cuisine), to the simple yet refined dishes of obanzai ryori (home-cooked cuisine), Kyoto is a city that takes food seriously. Today, you’ll experience the simple pleasures of obanzai ryori in a cooking class. Perhaps less well-known than kaiseki in the West, the ancient style of obanzai ryori also has strict rules that must be adhered to. It follows a strictly seasonal approach, and at least half of the ingredients must be Kyo-yasai (Kyoto vegetables) and other locally sourced produce. It should also embody the spiritual elements of genuine things, balance, encounter, hospitality and not creating waste. Ingredients are prepared simply, often simmered in dashi stock with traditional flavouring. Obanzai is down-to-earth, unpretentious and increasingly gaining popularity in Kyoto as people seek to ensure that this culinary tradition is preserved. You’ll then get to enjoy the dishes you have cooked for lunch. This evening is free for your own rest or exploration. Perhaps find a theatre putting on shows of Noh, Kabuki or Bunraku puppetry, or traditional dance, or splash out on a kaiseki meal in a ryotei (small restaurants serving traditional multi-course cuisine). Or perhaps try some hamo eel - a quintessential Kyoto dish in the warmer months. An unknown chef in Kyoto first transformed the eel from 'inedible' to the star ingredient with the invention of a heavy knife that could separate the flesh from the bones. In the cooler months you might try some yuba cuisine or a hotpot of yudofu, using Kyoto's famed smooth flavoured tofu, perfected over centuries by Buddhist monks. Your leader is always there to help you choose!